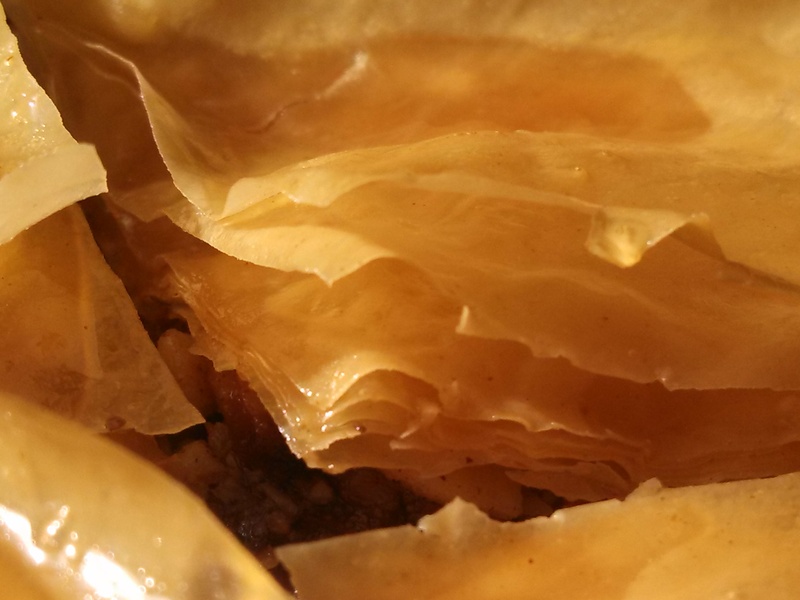 ← And…then there was baklava! As you can see in the previous entry, I made baklava this past Monday, which was a new experience on many levels. I’ve never made Greek food, or used phyllo dough before. I wanted to make the phyllo dough myself, as I’m that sort of baker; I want to make everything from scratch whenever possible! However, my fiancée was more familiar with it and urged me to spend the $4.00 for a pound, rather than complicate the process (at least until I’m more experienced with it). And when I opened the package and unrolled it that morning, I was glad that I took his advice, for it was far thinner then I imagined! Sometimes, when I look up a recipe, I find very different ingredients and/or amounts, so I tend to take the different parts I like of each one, whether it be technique or ingredients and combine them to come up with my own plan. This time, I had three I sourced from and I’m rather pleased with how it turned out. One thing I did that I didn’t see on my source sites but wanted to do anyway was to toast all my nuts beforehand. I used a glass pan and trimmed each sheet to size with a plastic knife, then managed to use the scraps to compose two more layers. Added cinnamon and lemon juice to my syrup. We don’t like things to be too sweet. The suggestion of vanilla made by one source seemed as though it would mute the flavors. Having only ever had baklava in ice cream, I expected it to be a bit more dough-like or cakey, but it turns out that I like it this way too. I leave you with my favorite shot of the final product, you can’t tell its baklava, but I love the layers! I’m off to plot this weekend’s sourdough. This entry was posted in Dessert! and tagged Baking, Baklava, Firsts, Greek, Nuts. Bookmark the permalink.